I just bought my first piece of art. 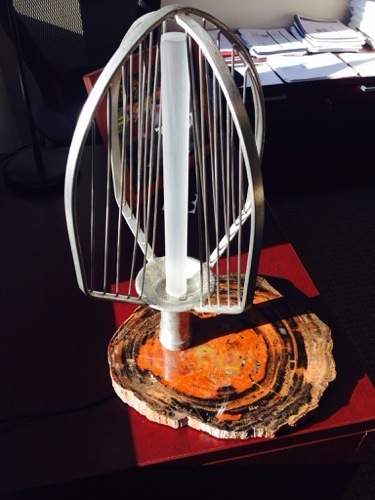 A friend, James Cooke, built a one-of-a-kind desk lamp for me. Here’s a picture of it. I’m writing about this because I’m very grateful for the insane creativity and amount of work. I’m also writing this because I think it’s important to support artists in our community. The lamp is a very cool piece of work that brings together nature and tech. James sourced an old industrial baking “whip” and used a piece of petrified wood as the lamp’s base. It was challenging to build. Drilling into the petrified wood, for example, took five hours with a hand drill and a diamond bit. For the lighting source, he used an eco-friendly 1 watt LED light, which is meant to last a lifetime. He also hand-sanded an acrylic rod to help project and channel the light source. Oh, and there’s no switch; he connected it all with a remote control and timer. It’s all very cool. Unique creativity is so awesome to behold. Thank you, James!